When you have a very limited amount of powder available, you can still test your processes with the Hosokawa Picoline. The Picomix is the mixing module in the Picoline. It is a high-shear mixer that allows you to work with 30ml to 100ml batches. The mini Cyclomix from Hosokawa Micron is a high-shear batch mixer for dry powders in a miniature scale. It is the downsizes version from the Hosokawa Cyclomix, which combines different processes in one single machine for intensive thermal processing of high energy input; high degree of dispersion and homogeneity and ultra-short cycle times. 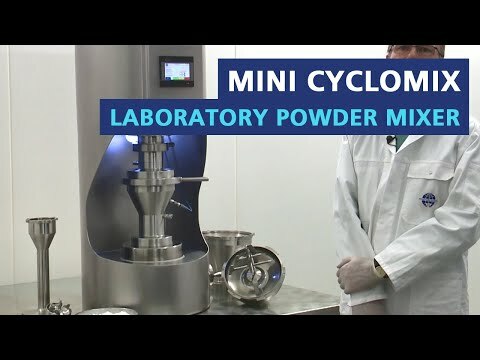 Moreover, the speed of this mixer can reach up to 6,000 L /min, the maximum volume it can handle is 20-100mL, and the product batch should weigh approximately 20 g. The result of the unique composition of the mixing element is an intensive homogenous and quick mixing of the powder components.